Located in one of the high peaks of the Kazdağları skirts in the Gulf of Edremit, Adatepe, a small village, continues to attract the interest of both investors and those who want to get rid of the city life and relax. 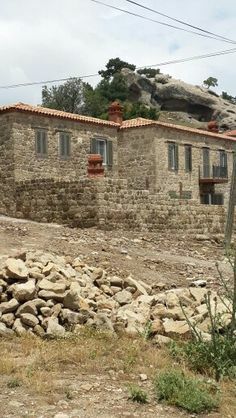 Stone houses and some old stables dating from 2-3 million lira at Adatepe are restored and used as residential, boutique hotels or cafes. After being declared a protected area in 1989, the village of Adatepe, whose historical texture is preserved, has become a highlight of its high income families especially in recent years due to its clean air, nature, silence and authenticity. Until 1940, in the village where the 550 houses, as well as the hammam, bakery, coffee shop, shoemaker, butcher, barber, olive oil factories, the number of the villagers decreased after the immigration to the city. The majority of the people who live in the villages where the villagers sell to high figures are the families from Ankara, Istanbul and Izmir. Nurullah Donkar, who came for the purpose of visiting the kite, stated that he was very impressed from Adatepe and said, “This is a beautiful village with preserved history, wooden stones and greenery adaptation. I have seen an integrated village, and the outsiders from local communities have adapted to each other, “he said. Sezer Tülek, who lives in Adatepe, said that “The locals of the village did not stay much, so the people living here used the urban villagers” expression. “Especially olive farming is widespread, there are those who come from other cities and settled in and built houses and restored houses and converted them into old barn cafes, and the number of households inhabited by the locals has been reduced to the number of fingers and dropped to 20.